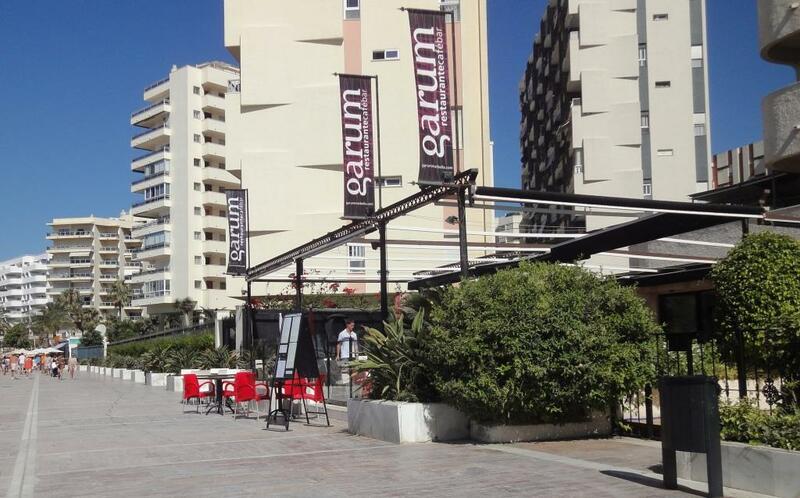 Finnish chef in Marbella at restaurant Garum on the Paseo Maritimo! Pleasant surprise which we did not know in advance when making table reservation. One of the waiters recognized our pronunciation and asked if we are from Finland. He mentioned it sounds the same as their chef’s. 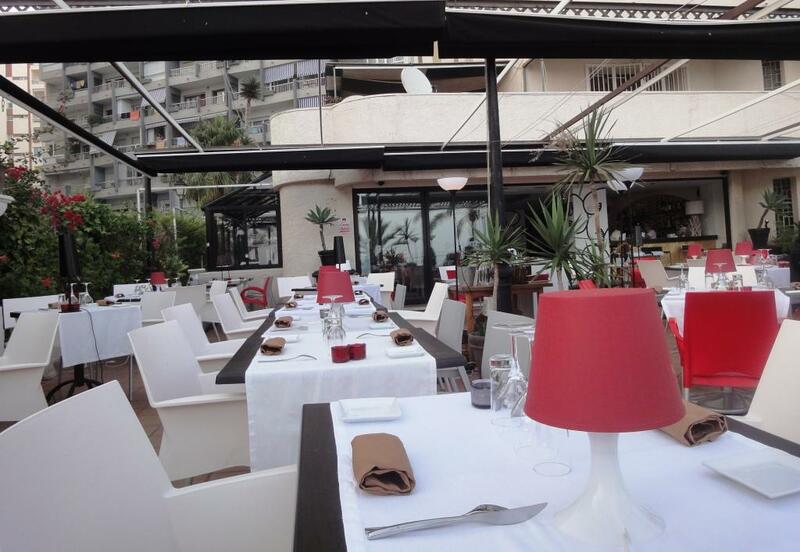 Restaurante Garum is decorated with modern style and therefore differs quite a lot from other restaurants on the Paseo Maritimo. It has cross-kitchen with some flavours from Scandinavia and Finland. On lunch time you can order tapas and traditional Spanish food but in the evenings kitchen is more international. There is a small bar terrace in front of the restaurant if you just want to observe by-passers especially during the evening rush-hour. Dinner started with Greetings from the kitchen. 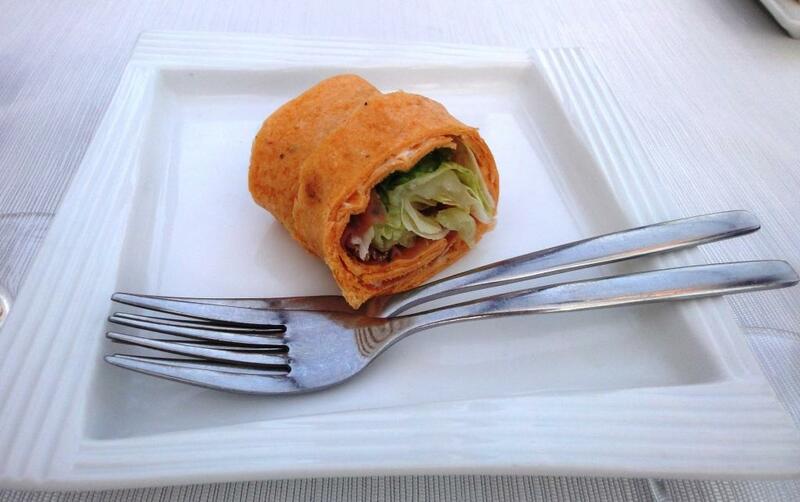 Simple snack but not bad at all. 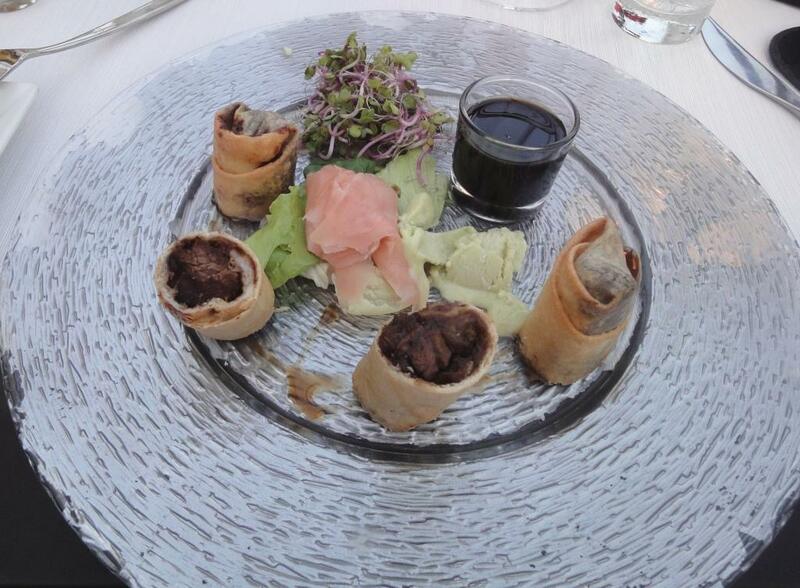 For starters chose Japanese beef spring roll with japanese flavours served with pickled ginger and wasabi ice cream and Scandinavian style marinated herring served with wheat beer sorbet, lemon aquavit jelly and lingonberry cream. Spring rolls were excellent and you could really find japanese flavours when diping them in wasabi and soya. 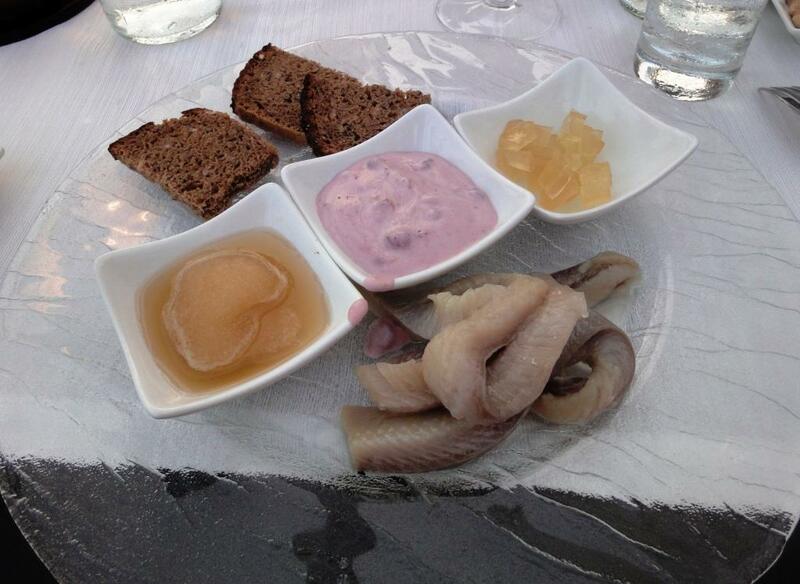 If restaurant serves sour or rye bread, herring and lingonberries then there must be Finnish chef behind it. Only questiomark was the sorbet as it was smelted or should it have been frozen? Kitchen served next food melter which was sorbet. 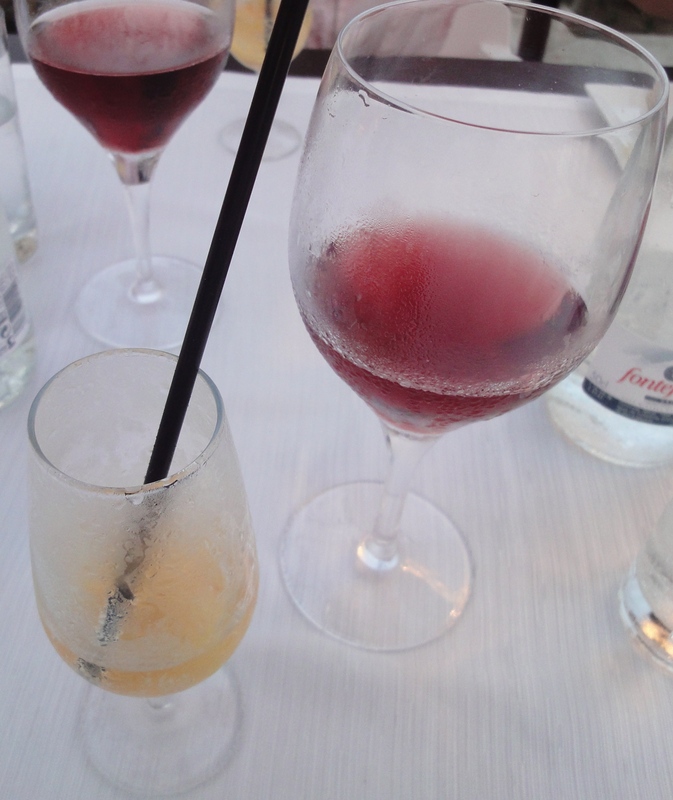 The smaller class on the left….right one is Spanish rose. You seldom find grilled that big prawns in Finnish restaurants, they are fried or prepared in oil if available at all. Therefore taste of prawns was scrumptious. 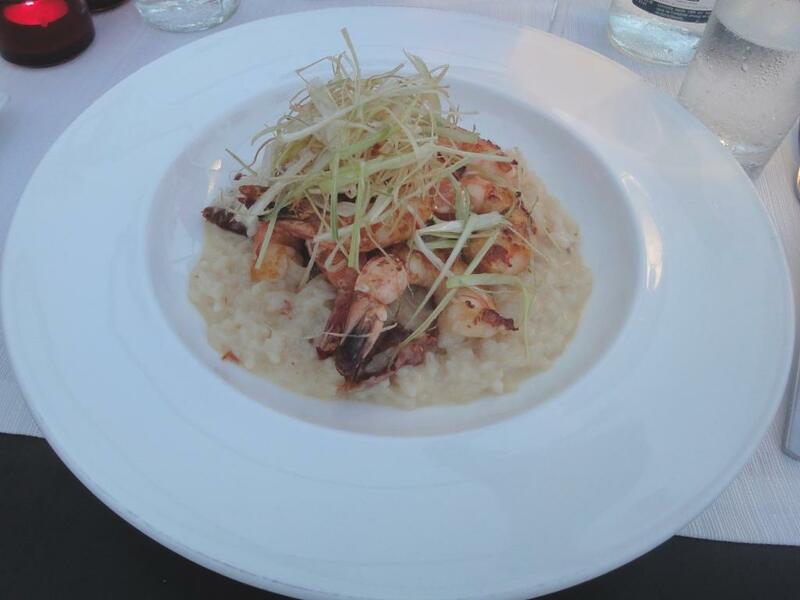 Risotto was OK but maybe too much porridge type. Huge portion of sea bass, usually you get two that size of pieces. In overall, portions were generous. For dessert Swan lake Raspberry and cucumber gazpacho with melon relish and limoncello granite. 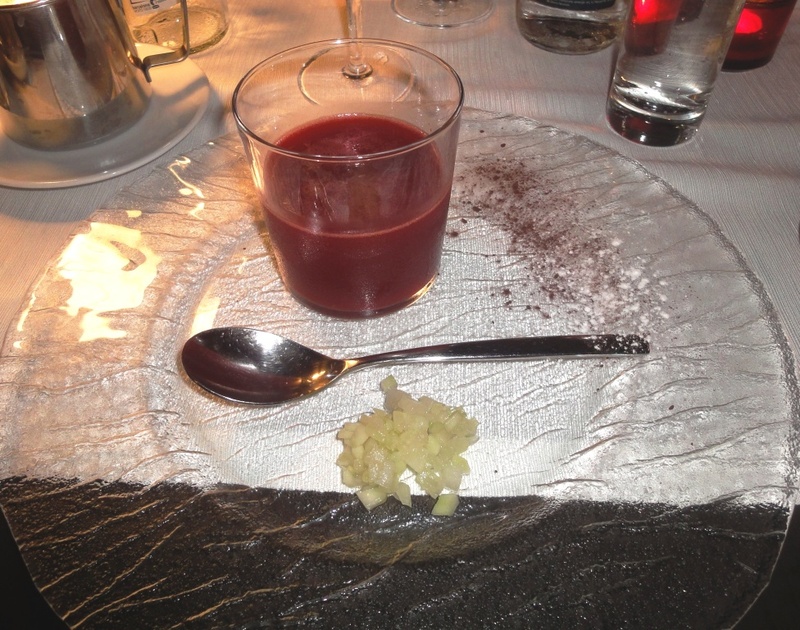 Brilliant idea to serve gazpacho as a dessert but of course from sweeter ingredients. Cucumber pieces were next to gazpacho class and added interesting flavour. Healthy, well-being dessert. If you find restaurant with Finnish chef during your holiday outside of Finland, then you are in safe hands. The terrace of Garum was almost full around 10PM, we came as early as 830PM. Of course location is one of the best, but restaurant can not survive long without good food and service. Restaurante Garum has them both. Garum offers discerning diners the dual attraction of being one of Marbella’s hippest establishments while also providing a versatile culinary experience. Centrally located in a vibrant and picturesque setting on the Paseo Marítimo, the restaurant is one of those rare gastronomic gems with an “all-day concept” of breakfast, lunch, dinner, tapas and late-night cocktails and soft chill out sounds − the kitchen remaining open non-stop from 11.00 am to midnight, seven days a week. Just ate here for the third time this week! Fabulous, innovative menu. 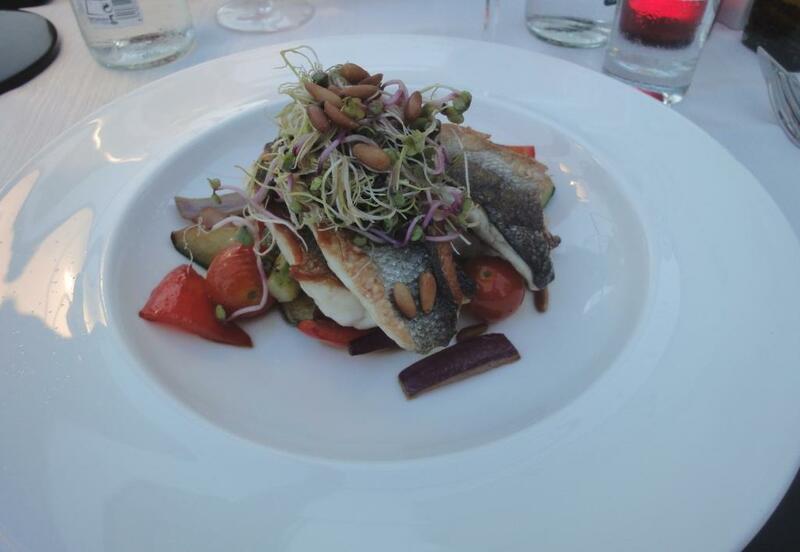 Lovely service and so many extra little treats….fabulous views of the Sea. The three of us loved it!